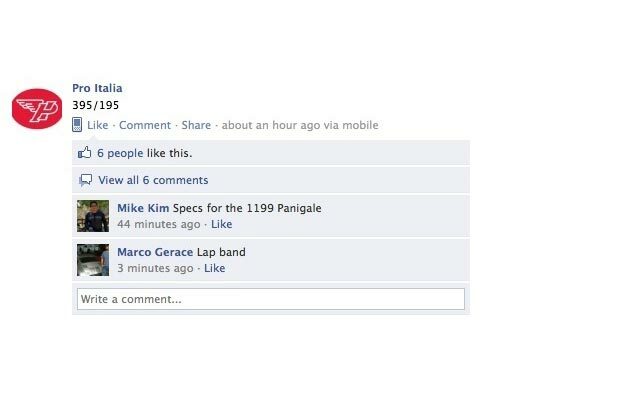 Confirming what we reported back in November of last year regarding the performance figures for Ducati’s new Superbike, Ducati dealership Pro-Italia posted on its Facebook wall (now redacted) a less-than-cryptic “395/195” message while in attendance at the Ducati Dealership meeting in Miami, Floria. Noting the wet weight and brake horsepower, the new 2012 Ducati 1199 Panigale makes good on its promise to trump its predecessor by over 20hp and 20 lbs. To thank for the these benchmark miracles is the 1199 Panigale’s very over-square Superquadrata motor (also known as the SuperQuadro in some rumor reports), which will rev higher than any other previous Ducati Superbike motor to-date, and the company’s new “frameless” chassis design, which has been floundering in MotoGP. While we can’t speak for the efficacy of Ducati’s new chassis philosophy, and how it will work on the company’s new v-twin production bike, the spec-sheet racers should be impressed with this latest piece of information. And as if those figures weren’t impressive enough already, Asphalt & Rubber has learned that the Ducati 1199 Panigale homologation special, the made-for-racing “production” model which has been making its appearance in the bulk of the 1199’s spy shots, has been producing over 205hp at the crank during its recent testing at Borgo Panigale facility (the namesake for the 1199 Superbike), while in its “stock” form. While we don’t know what naming convention Ducati will use on the race-bike-with-lights-on-it 1199, A&R does know that it will not receive “R” nomenclature that we’ve seen in the past. Clearly breaking from its traditional naming architecture, A&R has also learned that the Italian company will favor its new naming scheme, with the “S” model debuting as the Ducati 1199 Panigale EVO. Anticipated to debut at a later date than the 2012 Ducati 1199 Panigale base model and race version, the 1199 Panigale EVO will come with higher-spec components, and presumably make power in the 200hp range. The only question with the middle-range Superbike is when it will break cover, and how it will fit into the Ducati line-up both in positioning and pricing. As we already reported earlier, the Ducati 1199 Panigale is expected to hit the pocketbook harder than the Superbike 1198, with prices in Europe and in the USA likely to go up by several thousand dollars. How will the Ducati 1199 Panigale fare with a steeper price tag, but staggeringly better performance than its predecessor? Only time will tell, but we like what we’re seeing so far (though we are a bit biased around here).